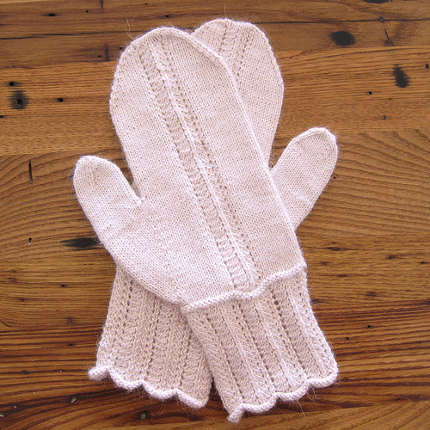 Kat over at Just Crafty Enough has a great goal for 2014: designing a pair of mittens every month. Her February pattern is sweet and romantic but still warmish. They’re pretty and have a bit of lace, so they’re not for shoveling the walk or getting into a snowball fight, but may be just the thing for your Valentine’s date. They have a long lacy cuff and the lace pattern continues in a panel up the back of the hand, which is why they’re not totally warm, but it’s a small enough section that you won’t feel like there are giant holes in your mittens. I think they’re pretty darn cute, and the lace is easy enough to work for someone who hasn’t done a lot of lace knitting in the past. We should have a KAL for mittens?